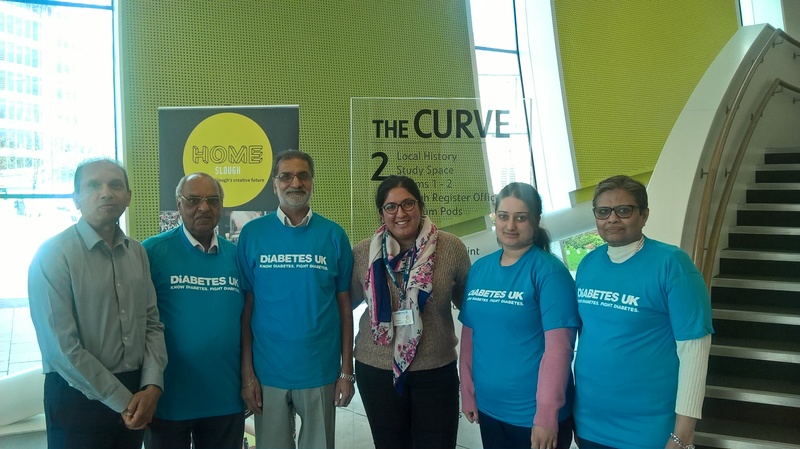 Six newly recruited Community Champions are helping to make a difference across Slough by increasing awareness, prevention and self-management of diabetes. The Champions, who are all from ethnic minority backgrounds, have been recruited as part of a community project which has been commissioned by NHS East Berkshire Clinical Commissioning Group (CCG), and is being run by Diabetes UK. Slough has the highest prevalence of diabetes in the South East, with 8.9% of people living with a diagnosis. Slough also has a high proportion of BAME (Black, Asian and Minority Ethnic) patients. People from South Asian, African and Caribbean communities are two to four times more likely to develop Type 2 diabetes than White Europeans. They are at greater risk at lower levels of BMI (Body Mass Index) and at an earlier age. In Slough, the number of people diagnosed with diabetes has increased by 6% since last year – to 10,491. The role of a Champion is to help to educate and raise awareness of diabetes and Diabetes UK by organising local events, and delivering presentations and talks. They will be able to explain what Type 2 diabetes is, who is at risk, signs and symptoms, myths and misconceptions, complications, and the NHS services that are available to people locally; including the NHS Diabetes Prevention Programme (NHS DPP). They will also inspire others to help reduce their risk of diabetes, or to manage their diabetes better. “We are taking a holistic approach to Type 2 diabetes prevention in our region and the NHS DPP and the Community Champions are an important part of that. We hope that the Champions will be one way to promote the NHS DPP in the community; they will be key in engaging those that may be at risk to take up the offer of the Programme if they are given the opportunity. “We are delighted to have been commissioned by East Berkshire CCG to run the Community Champions programme in Slough. We are equally delighted to have six Community Champions now on board, with others in the pipeline to join.